In January 2003 Trevor toured Germany and Holland with the Big Chris Barber Band and subsequently joined the band on a permanent basis. In July 2004 he came off the road to resume his career as a freelance soloist and side man. However, he rejoined the Barber Band from January 2010 till January 2011 and the later from November 2014 till August 2017. We wish Trevor all the best for his future career. Trevor was born in London in 1959. After initially learning tenor horn in the school brass band at the age of eleven, he heard recordings of New Orleans clarinettist Sidney Bechet and immediately decided to switch instrument. This was the beginning of a lifelong passion for jazz in its various forms. Trevor taught himself the rudiments of clarinet and saxophone, and by the late teens was beginning to do gigs with various traditional and mainstream bands around the London Jazz Circuit. By the mid-eighties he had formed his own group the "Swingtet" which featured notable musicians such as trumpeter Ray Crane, pianist Martin Litton, guitarist Paul Sealey and drummer John Armatage. The Swingtet was regularly featured in the B.B.C's Jazz Club broadcasts. During the early eighties he worked on several occasions with the late Ken Colyer. Since the eighties, Trevor has often enjoyed working and recording with visiting Americans including Al Casey, Art Hodes, Scott Hamilton, Marty Gross and many others, in between a busy freelance schedule. 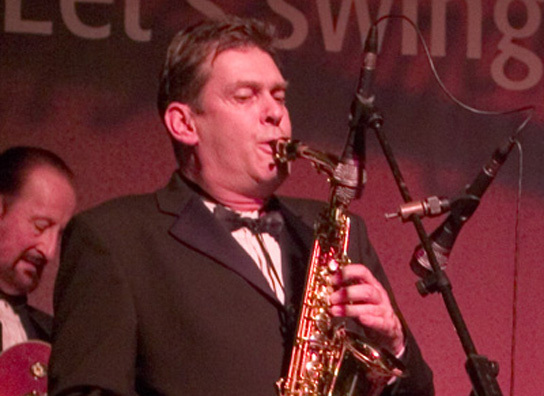 In recent years he has appeared live and on recordings with new vocal star, Clare Teal. Music: You can listen to Trevor Whiting play the sax solo in an excerpt from "Misty Morning", from the 2003 Big Chris Barber Band CD, Jubilee Stomp.